Filipina fighter Jomary Torres sees it as a privilege to be fighting side-by-side with fellow homegrown martial artists on the undercard of ONE: KINGS & CONQUERORS in Macao. China on Saturday, August 5. 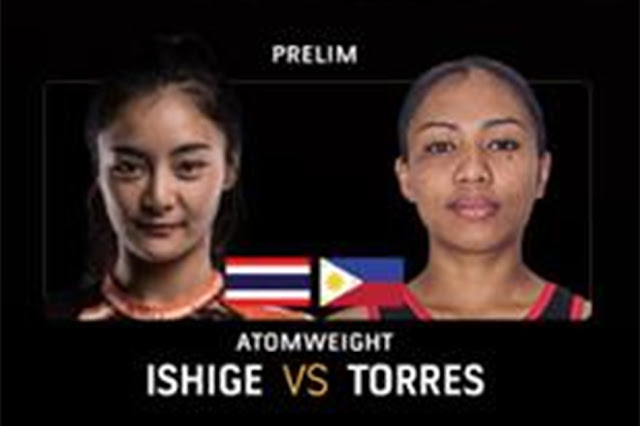 Torres, who squares off with rising Thai superstar Rika “Tinydoll” Ishige on the aforementioned card, relishes the opportunity to represent the Philippines alongside combat veteran Eric Kelly as well as one-time flyweight world title challenger Joshua “The Passion” Pacio. “I am very happy because all of us are representing the Philippines and not against each other. This is good. I hope all of us will win on fight night,” she said. Kelly locks horns with former ONE Lightweight World Champion Kotetsu “No Face” Boku, while Pacio looks to get another shot at Yoshitaka Naito’s gold-plated strap as he crosses paths with seasoned Japanese stalwart Hayato Suzuki in a three-round strawweight encounter. “We get to represent the country. It’s really an honor and a privilege. We are one team in Macao. We are all hoping for a clean sweep,” Torres stated. Torres, who holds a fledgling professional mixed martial arts (MMA) record of 1-0, is not expecting to be other competitor’s footstool to move up in the rankings as she intends to walk out with the victory in her ONE Championship debut. “It’s my first time to compete in ONE Championship. I am honored and blessed to be in this top-notch organization, which is widely considered as the frontrunner of MMA in the region. Of course, I am aiming to get a big win. I’ve worked hard just to make it here. I won’t waste this opportunity,” she claimed. Torres is a talented Filipino prospect who trains out of the Wushu-savvy Catalan Fighting System gym. Moreover, Torres had her lone match in August 2016 at a local Filipino MMA event, where she took a convincing unanimous decision triumph. However, Torres is fully aware that having her hand raised against a well-rounded MMA competitor like Ishige will be a tough task. “I am prepared for this fight. Every fight is a challenge for me. But I welcome all challenges. Bring it on,” she expressed. ONE: KINGS & CONQUERORS is set to take place at the glamorous Cotai Arena of The Venetian Macao.